It’s been “All Peregrines, All The Time” for the past week but for those of you following the anatomy lessons, never fear. The series continues every Friday (barring a peregrine “emergency”) because I haven’t gotten halfway through the bird yet. We’ve just reached the underside where the body part names are often the same ones we use to describe our own anatomy, so you’re going to have an easy time of it for a while. Stay with me, though. It will get interesting later on. First up is the throat and the best bird to illustrate this is a male ruby-throated hummingbird. Just in case you’re wondering where his throat is I’ve pointed to it with a pink arrow. 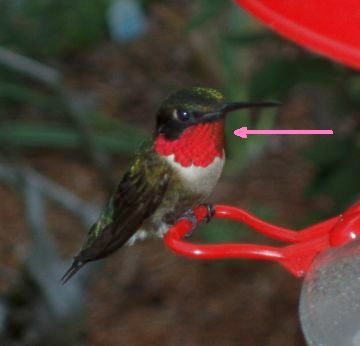 The throats on female ruby-throated hummingbirds are white. The males have iridescent red feathers which only look this red when the light catches them just right — and then they’re so red they knocks your socks off. Yes, the throat on a bird is where you’d expect it to be. I am so pleased that Anatomy lessons will continue. They are well-written and informative.